Then last night the Jets rookies took to the ice as a team, playing their first contest in the Penticton rookie tournament which includes prospects from Edmonton, Vancouver, Calgary, and San Jose. They posted a 4-0 win over San Jose’s rookies, with goals from Levko Koper, Mark Scheifele, and Jason Gregoire. While several players made a strong effort, it was Scheifele who stood head and shoulders above all the rest. He scored a shorthanded breakaway goal on a quick backhand deke and added an assist by threading a pass through a defender’s legs perfectly onto Jason Gregoire’s stick. While he didn’t hit the scoresheet, Ivan Telegin displayed lots of skill and poise when in control of the puck, especially on the powerplay where he’d set up along the right half-wall and draw in opposing penalty killers before distributing the puck to an open man. Carl Klingberg played with an edge, driving the puck to the net and taking opponents hard into the boards on a few occasions. He also got knocked around a few times, but didn’t shy away from the physically imposing Taylor Doherty, who stands 6’8 and weighs 230. Defenceman Zach Yuen was also impressive, showing good decision making and puck moving ability on the powerplay, though he’ll need to improve his foot speed to play in the NHL. Meanwhile Zach Redmond – a defenceman out of Ferris State University – is the most offensively gifted defenceman in rookie camp and showed great puck carrying ability. However, at 23 years old, he’s the oldest player in camp – five years senior to the aforementioned Zach Yuen. Because of that advantage, he’ll need to be dominant in order to convince Jets’ brass of his NHL potential. Goaltender Edward Pasquale was solid between the pipes, recording a 27-save shutout. However, he’ll face a much stiffer test if he starts again tonight, as the Edmonton rookies are surely the best in the tournament. The best thing about the Kyle Wellwood signing isn’t what it does for the Jets, but how it affects the farm club. On his own merits, Wellwood is a sleek puckhandler who will be useful on the powerplay and on faceoffs. Apart from that, he’s small, slow, and not overly interested in the defensive aspects of the game. However, adding Wellwood pushes someone else down the roster and into the AHL, adding even more talent to a pretty good looking squad. At this stage, it’s more important for the organization to win at the AHL level, as this will help develop key prospects in a favourable environment and give them playoff experience which they may not be able to get in the NHL for another few years. Andrew Ladd, Evander Kane, Bryan Little, Blake Wheeler, Alex Burmistrov, Nik Antropov, Kyle Wellwood, Jim Slater, Chris Thorburn, and Tanner Glass. That leaves three spots. Previously, I thought it would be contested by five players – Maxwell, Cormier, McArdle, Stapleton, and Machacek, but that was before the training camp invitees were announced. The list includes former Avs goaltender David Aebischer, and forwards Troy Bodie, David Koci, and Janne Pesonen. A former NHL starter, Aebischer has spent the past three years in the Swiss-A league. He doesn’t stand much chance to crack the Jets roster unless there’s an injury, but he might show well enough to get signed by another NHL team looking for a veteran backup. The player with the best shot to crack the lineup is Troy Bodie, a North-South winger who has played 103 NHL games in the past two years with Anaheim and Carolina. He provides little or no offence at the NHL level, but he’s 6’4, 220 and a pretty good skater for a player of his stature. He’s a pretty good bet to play RW on the 4th line, or at least be the team’s 13th forward. 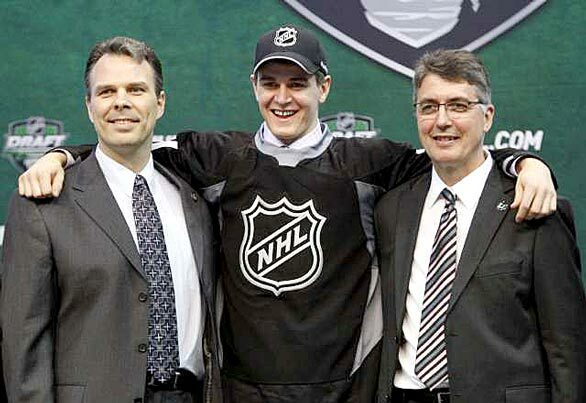 Meanwhile Pesonen is a 29 year old Finnish player who had a shot with Pittsburgh in ’08-’09. That year, he dominated the AHL with 82 points in 70 games, but was held scoreless in 7 NHL contests. Koci is a heavyweight enforcer who played 35 games with Colorado last year. He has no NHL playing ability apart from the work he does with his fists. This entry was posted in Winnipeg Jets and tagged Ben Maxwell, Carl Klingberg, David Aebischer, David Koci, Edward Pasquale, Ivan Telegin, Janne Pesonen, Kendall McArdle, kyle wellwood, Mark Scheifele, Mark Scheifele impressive, Mark Scheifele WJC Canada, Patrice Cormier, Spencer Machacek, Tim Stapleton, Troy Bodie, Troy Bodie Winnipeg Jets, Winnipeg Jets depth chart, Winnipeg Jets line-up, Winnipeg Jets prospects, Winnipeg Jets Rookie Camp, Winnipeg Jets Roster, Winnipeg Jets training camp invites, Zach Redmond, Zach Yuen by Peter Siamandas. Bookmark the permalink.